A bill designed to wreak havoc among public sector unions in Florida passed the state House on Jan. 25, and it now awaits action in the Senate. Under House Bill 25, sponsored by Republican Scott Plakon, public sector unions would be required to report annually to the state how many employees are eligible for union representation and how many pay dues. If less than 50 percent of eligible employees are due-paying members, the union would automatically be decertified. The only exemptions are for law enforcement officers, firefighters and corrections officers. The IBEW represents public sector members in a number of areas including county school board maintenance, municipal utilities and as city employees. King says that members across the state of Florida could be harmed if the bill becomes law. Tampa, Fla., Local 915 Assistant Business Agent Larry Jenkins, left, lobbies in Florida’s capitol building in Tallahassee with Daytona Beach, Local 756 Executive Board Member Brian Porter and Vice President Roger Zoline against a bill that could decimate public sectors unions. Joseph E. Slater, a law professor at the University of Toledo, told Think Progress that the bill is both unique and yet still consistent with other attacks on unions. Last session, Plakon introduced a nearly identical bill in the House, according to the St. Augustine Record, which also passed. A bill has been introduced in the Senate, but “has long odds of getting any traction,” reported the Miami Herald. 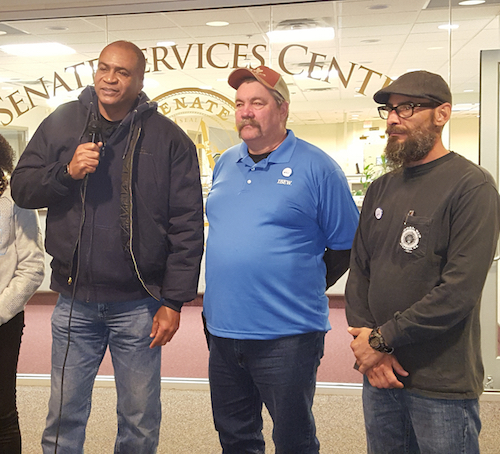 Before the vote, IBEW members from Tampa, Fla., Locals 824 and 915 and Daytona Beach, Fla., Local 756 joined the Florida AFL-CIO’s Working Family Lobby Group to talk with House members on the issue and others impacting working families. The cohort included more than 50 activists and is part of a weekly lobbying effort designed by Florida AFL-CIO President Mike Williams, also a member of Jacksonville, Fla., Local 177. But Florida is hardly alone when it comes to conservative legislators putting the screws to public sector unions. A similar anti-labor bill was signed into law in 2017 in Iowa. There, recertification votes are now required for public sector unions in the year leading up to a new contract. Since it’s become law, one such round of voting has taken place — and employees statewide voted overwhelmingly to keep their unions, by a stunning 45-1 margin. In 2011, Wisconsin passed Act 10 into law, which mandates annual recertification whether employees request it or not, and unions must get a majority of employee support. Since passage, a Milwaukee Journal Sentinel analysis found that membership dropped from 14.2 before Act 10 percent to 8.3 in 2015 — the largest decline in the nation for that time period. These laws are part of a broader attack on the rights of public sector employees and it extends all the way to the U.S. Supreme Court. A case currently being reviewed by the court, Janus v. the American Federation of State, County and Municipal Employees, will decide whether decades of precedent should be overturned. If the court rules against working people as it is expected to, public sector employees who choose not to join a union could skip so-called agency fees, which are necessary to cover the costs of collective bargaining and union representation. Such a ruling would shift the cost burden onto existing members and deprive unions of the much-needed funds to properly represent every person in a workplace. Janus will be decided sometime this year before the court adjourns in June. If it’s decided in favor of the plaintiff, Illinois state employee Mark Janus, it would effectively make all public sector unions right-to-work, impacting tens of thousands of IBEW members.